Customer experience is still not a common expression, and user experience design is not a common practice. Certainly not in Kuwait. I explained to an inquiring friend how customer experience takes the needs of the customer into consideration, and aims to maximize and intensify positive emotions, and eliminate or reduce negative emotions from the customer’s interaction with a company and its products. The fact is, the philosophy, principles, and practices of customer experience design are applicable beyond the corporate world. “Customer” should be defined very loosely. 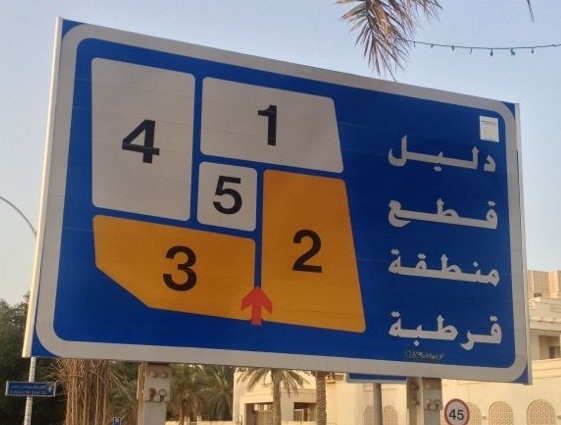 I gave my friend a simple example of how area road signs can be improved in Kuwait, which will help drivers avoid frustration and gain confidence on the road. I pointed out how area road signs only give the layout of the blocks in the area, which is useful for a driver to navigate his way within the area, but offers no information on the best way to navigate out of the area. If a driver is not familiar with the area he’s in, it’s important to know which exit will take him on the road he wants. A simple solution would be to add that piece of information. My friend Barrak Al-Babtain liked my suggestion and, within minutes, came up with a redesign that incorporated this idea. He even included information about the surrounding areas, which would help drivers navigate their way between areas, and to gain a better impression of the way Kuwait’s areas are laid out. This redesign came about by considering how a driver might feel with what little information he is presented in the current area road signs, and what additional information can be provided to eliminate the confusion and frustration he can experience as a result. If you’re interested in innovative ways to improve life in Kuwait, I recommend you follow the good work of QortubaME on Instagram. And if you have your own simple solutions to common problems (on the road or off), I would love to read about them. The comment box is your soap box. Adding context to the road sign seems useful (at least to me). But the redesign overall is weaker I think. The contrasting colors in the original design work better. Also, there seems to be an instant trade-off when fitting more content in a sign with fixed size. The ability to glance from distance while driving (the only use-case) will likely be taxed here. Especially if you account for 40+ year-old drivers. Hamad, I totally agree with you about color contrast and glancing from a distance. Thanks for raising both issues. This is an initial design to demonstrate what kind of additional information can be useful to area road signs. The colors will need to have sharper contrast for sure. I’m not sure if road signs have fixed sizes, though. The re-design will need tweaking to ensure that the added value of the new information doesn’t compromise other user requirements. 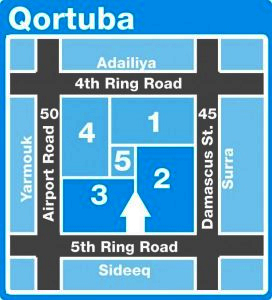 Maybe we can save some space by removing the useless ‘دليل قطع منطقة’ and keeping the area name قرطبة. Yes. And move it to the top to make it more visible. In both Arabic and English.